While doing research for another story, I was introduced to an extraordinary couple, Mike and Robin. They live in an old Rhem House. 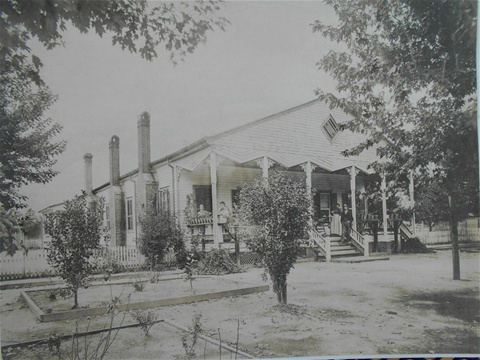 Rhem houses were built in the 1800’s with a specific design created by the two Rhem brothers who built them. There were just a few of them constructed and this one is the last one standing. Robin has become a bit of a historian about her famous home by researching and collecting data. She shared pictures of the original design as well as a history lesson on the area, designers and the ghosts that dwell in the residence with them. “Aren’t you afraid or scared?” I asked as I turned on a tape recorder. Robin began, “Mike is usually gone for a few nights at a time and I knew, during this one week, he was supposed to come in on a Friday. As a rule, Mike will text me before he gets here and say, ‘it’s me, don’t shoot,’ so that I won’t pull my gun out and shoot him by accident. They both reported they frequently would feel someone distinctly sit down on the bed. Together, they shared with me how one night they woke up and had several different ‘visitors’ of a white mist circling their bed looking down at them. Mike and Robin stated that something has happened in every room of the house. Although, they always look for a reasonable explanation of the strange things that happen, they’ve concluded that no room in the house has been left unvisited by their ghostly roommates. “Tell her about the bubble,” Mike exclaimed while I pushed the tape recorder closer to them. “I already did when you were inside,” Robin confirmed. They are referring to the time Robin was in the kitchen doing the dishes and Mike was standing next to her talking. One of the dish soap bubbles had floated up to the ceiling. As Mike chatted away, he watched the bubble go up, up and up. Immediately, the bubble floated straight down and stopped just centimeters from his nose. As we prepared to go inside and tour this beautiful Rhem home, Robin and Mike talked about several different things that have happened, like someone scratching at the window from the outside or seeing apparitions, hearing phantom noises and smelling strong scents of cigarette smoke when neither of them are smokers. Each room we stopped at they shared an anecdote of an incident that had occurred in the room. I snapped pictures of several rooms as we went by. My brother would be so envious. He loves old structures and historical buildings and I couldn’t wait to taunt him with my treasure of an original Rhem home, hence the pictures. I had to snap two pictures of their game room because Mike was in the first picture. I stepped back into the game room and snapped a third picture as I turned off my tape recorder. We started talking a bit more so I turned it back on until we were walking out the door. As I shut it off again, Robin gave me her phone number. I turned it back on and looked at my recording count … three. I recorded Robin’s number. “Did you get it,” she asked as I turned it off for the third time. As the interview wrapped up, I graciously thanked my hosts for allowing me to come into their beautiful and stunning house, take pictures and even share with me their amazing experiences. Several days later, I was going through the pictures of their home. I noticed something odd about the three pictures of the game room. There was Mike in the first one. The second picture was the one without Mike and the third had more in it than the cat that followed me in when I took the last picture. The first thing I noticed was that the room was a lot brighter than the previous pictures. The second thing I noticed was something in the plant that sits in the corner; it was an orb. Then I noticed many more orbs. I reached for my tape recorder to pull up Robin’s phone number. I only had two recordings: the previous interview and the one of us talking outside the house. The two recordings I made while inside, including Robin giving me her phone number were gone. Even more odd than that: I am a member of three closed groups on Facebook that features paranormal activities and hauntings. To be sure I wasn’t the only one who saw the orbs; I posted the pictures on all three sites to see if anyone else saw them. One person from each paranormal group stated they could also see a face by the plant. I could not see it. I had finally gotten in touch with Robin and showed her the pictures, too. She could not see the face, either. We decided to post them on my own Facebook page and see what happens. My niece, Windy, saw the face right away and circled it for me. Now, we see the face. How did we miss it? Anyway, thank you Mike and Robin for allowing me this opportunity.